Like me, if you're a certain age, then you'll have a soft spot for one of the biggest selling concept albums of all time. I recall my excitement as a teenager looking at the Mike Trim, Peter Goodfellow and Geoff Taylor artwork whilst Phil Lynott belted out 'Spirit Of Man' on our very bog-standard record player. 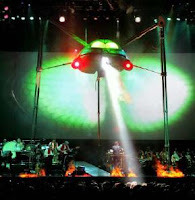 There was something very appealing about the songs for Jeff Wayne's musical version of 'War Of The Worlds' and the incidental music combines rock, funk and electronics with orchestra to provide a truly operatic feel to an already well loved science fiction novel. I had the opportunity to watch the DVD of the live, touring version about a year ago in wonderful surround sound on a pretty big screen and was duly impressed. I noticed that the tour was coming to Manchester and so our friends booked us in and one year later, on a cold December evening we took our seats. It is an amazing piece of showmanship: Wayne conducts an orchestra and a full rock band (containing some of the original musicians from the album) in front of a huge widescreen projection full of Martian war machines, battles, devastated landscapes, red weed and ghastly looking Martians all made possible by the wonders of CGI. The centre of the stage is periodically dominated by a fully realised war machine, belching out its heat ray, exploding as artillery shells supposedly hit it. Add in fantastic lighting and performers such as Justin Hayward and Chris Thompson from the original album cast and newcomers Alexis James and Sinead Quinn all bringing the original songs to life. Even Richard Burton is realised on stage as a 3D projection. It's certainly one of those shows where the hairs on the back of your neck stand up and you get tingles down the spine immediately as Burton's famous narration begins and that fantastic string section goes into 'The Eve Of The War'. What also comes across is just how many people are really into this as the MEN arena is jam packed. There's a lovely sign of affection as Jeff Wayne walks on stage and a heckler yells out 'Go on Jeff, give it to them!' And by Jove, he did. If it has any faults it is perhaps that the CGI could be better. The images, whilst impressive, now look a little primitive compared to what can be achieved in 2007. Justin Hayward, in fantastic voice it has to be said, is rather too stiff and needs to add some movement and passion into selling a song like 'Forever Autumn'. He should certainly take a leaf out of Alexis James' book as his performance as the Artillery Man was hands down the best of the lot and what I would consider an indifferent song on the album, 'Brave New World' is given a fantastic new lease of life through his performance alone. The demise of the Thunderchild is also very dramtically brought to life by the gravelly tones of Chris Thompson. Minor niggles, I know. It's a powerful, eye-popping show, stunningly achieved and it loudly and proudly showcases the power of the music and songs that seemed to have sustained themselves since 1978. If you get a chance to see this then I urge you to go. bigrottie, thanks for that. I think you're right. It certainly was lost on me that Hayward was representing the suspended head but now you mention that then it's really obvious isn't it! But I still think he could have been a little more passionate. And yes, he's worn well, bless him.